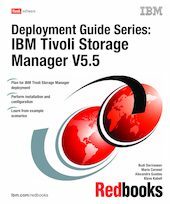 The objective of this IBM Redbooks publication is to provide comprehensive instructions for deploying the IBM Tivoli Storage Manager to various environments. Readers should possess general knowledge of communication network architecture and design, basic size considerations of the Tivoli Storage Manager database, and basic pool management of Tivoli Storage Manager servers. This document is intended to be read and used by presales systems engineers and services personnel to build a customized deployment of the Tivoli Storage Manager. We expect such individuals have significant knowledge of Tivoli Storage Manager, and ideally the reader has attended Tivoli Storage Manager basic and advanced training classes. This book is a valuable addition to, and can be read in conjunction with the existing product documentation.